The ability to forward emails to your project is especially useful when there's a conversation happening outside Basecamp. If your project members start drifting toward using email, forwarding email is a great way to bring the conversation back to Basecamp! Forwarded emails are stored along with all your other project items. 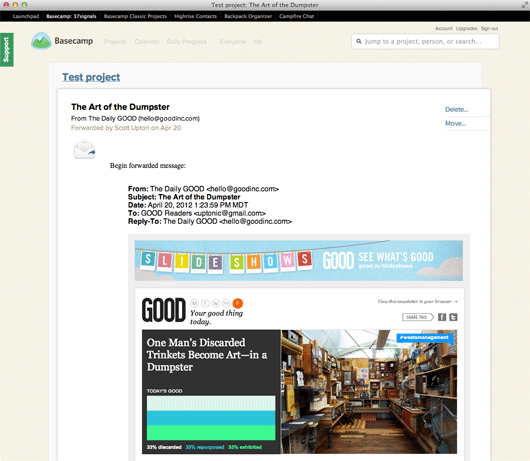 Use the Email-in feature to forward an existing email to your Basecamp 2 project. Your forwarded emails are all stored together. Attached files are included. If it's an HTML email, Basecamp will show it. You can comment on forwarded emails the same way you can with discussions, to-dos, files and so on.